Lately an itchy feeling has been growing somewhere deep in my brain, a weird little mosquito bite bump with a tiny toothy mouth and scary smudged lipstick, sorta like in that Beckett play, and it says to me, Haven’t updated your website in a while, have you? People will think you’re one of those lazy non-website-updating jerks who start websites and then don’t update them. Also you look weird in that photo from last time. You want people to think you’re a hardworking writer/grad student, you better get typing. And then the freaky talking mosquito bite starts cackling because it knows it has hit all the anxiety buttons, and I become terribly anxious to prove that I am not only semi-normal-looking and hardworking but also not as crazy as this whole paragraph seems to prove. Thus, this post. First, some actual news! Blurring the Line is now available for pre-order, and you can see the full contributor list, and there’s a lot of cool people in it, way cooler than little old me, and yeah! Buy it, if you’re interested, and it will show up on your electronic reading machine on November 26th. Other news! I have received and corrected galleys for my article on the merveilleux scientifique in Third Republic French fiction, which is set to appear in The French Review next March. Yep. I’m pretty excited about it. Mostly! I am working on my dissertation, and trying to eke out stories bit by bit, and sending them out to editors on little gusts of hope, and you know what editors do with hope, don’t you? … I was going to tell you that they toss it in a blender with fresh kitten blood, three shots of Everclear and a dollop of mascarpone, but that’s not true. They don’t care nearly that much. In addition! I’ve been learning to swim. Yes, yes, I know, swimming’s easy, nobody taught you, somebody just threw you in the pool and you’ve been paddling around like a goddamn golden retriever ever since, so what am I bragging about? Well, I’m not bragging, but some of us have never been quite so confident in the laws of physics or our own ability to manipulate them. Nor had I ever seen much evidence that I possessed any natural buoyancy (in fact, the contrary seemed true), so I approached the idea of floating much as I did the idea of levitation: Nice trick, if you can manage it. But I am pleased to report that I am as buoyant as the average person, and proper arm-waving and leg-kicking have the predicted effects, and I can now sort of do the front crawl. So if someone threw me in the deep end, the last you saw of me would not be just my middle finger slowly sinking under the water as I drowned. No, I would splash victoriously to the surface and swim (very slowly and awkwardly) away into the sunset, and never speak to that evil Lia-throwing person again. Lastly! To counteract the idea that I looked weird in the previous photo, here’s another picture! in which I look really, really weird. 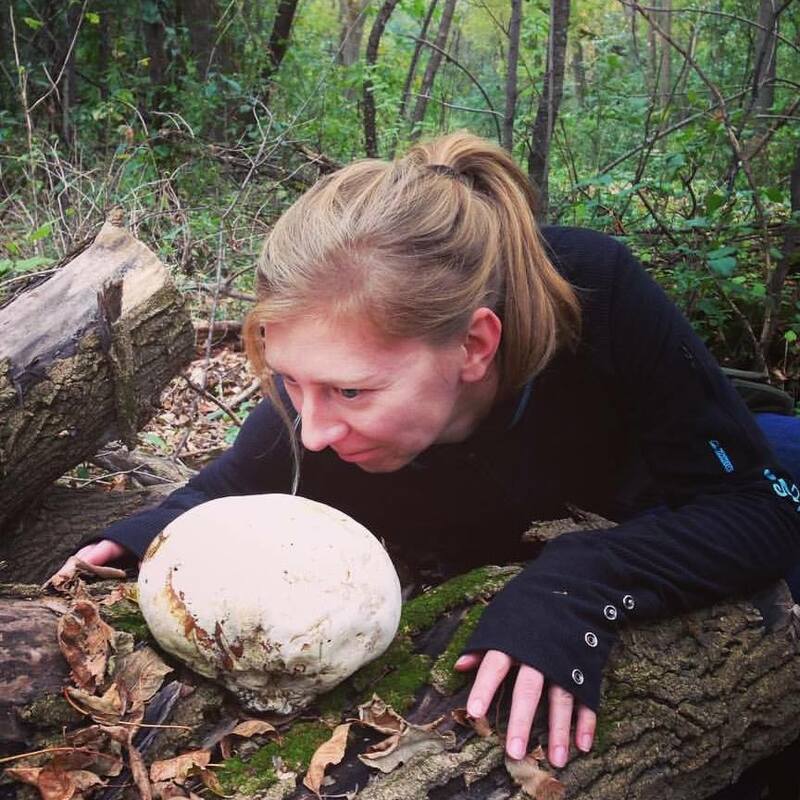 Here I am with a giant puffball mushroom, pretending like I am an intensely fascinated forest creature, or maybe a zombie mistaking it for brains, or something like that. The mushroom was kinda old and smelled like rotting feet. Photo by Jeff Mitchell, taken in Lake Elmo Park Reserve, October 2015.
why counteract the idea if it’s true, eh?